"All the world’s a stage, and all the men and women merely players...."
After the success of Twelfth Night (2016), Cyrano de Bergerac (2018), and Thereby Hangs a Tale (2018), A.B.L.E. (Artists Breaking Limits & Expectations) is thrilled to continue their partnership with Chicago Shakespeare Theater this spring. 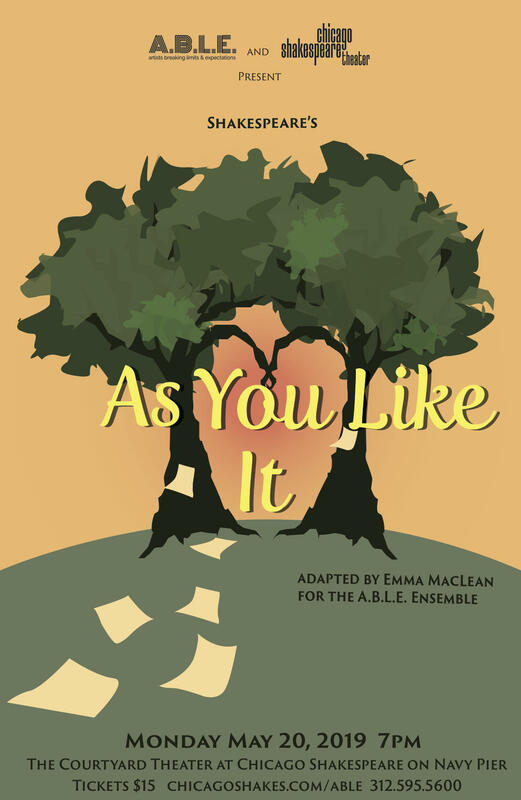 The ensemble, 19 young adults with Down syndrome and other developmental differences, will take the stage for one night only on Monday May 20, 2019 with an original adaptation of Shakespeare’s wacky and whimsical comedy, As You Like It. As You Like It is about navigating conflict, learning to forgive, and celebrating your identity - themes that are especially relevant for A.B.L.E.’s young participants with developmental differences. Adapted and directed by A.B.L.E. teaching artist, Emma MacLean, the script has been tailored to the individual strengths of the ensemble. The cast will put their unique stamp on this “wonderful, wonderful, and most wonderful” comedy, bringing The Bard’s poetry and prose to life through scenes, monologues, dances, and puppetry. Actors will share roles, with each playing multiple characters as “one man in his time plays many parts”. As Rosalind learns, sometimes we have to become something quite unlike ourselves, to find who we truly are. Get lost in the Forest of Arden with us!